South African agriculture is a dualist agricultural system with well-developed commercial farmers and resource-poor smallholder farmers. In an effort to address the dualist nature of agriculture, the South African government has developed a strategic plan to assist smallholder farmers in entering commercial markets. The strategic plan aims to advance subsistence and smallholder farmers into commercial production through improved resource management for sustainable food security and smallholder livelihood. However, the productivity of smallholder farmers continues to be very low compared with that of commercial farmers. Our aim was to compare tomato productivity for commercial and smallholder tomato farmers in the Nkomazi area (Mpumalanga Province) using a metafrontier analysis. We used an output-oriented data envelopment analysis metafrontier approach and the Tobit model to investigate smallholder and commercial farmers' technical efficiencies and related factors which affect tomato production. 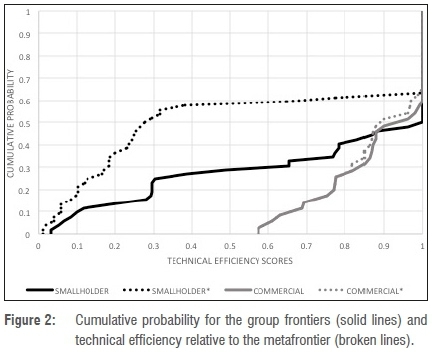 Results indicate that smallholder farmers have high levels of technical efficiency compared to the group frontier (0.74), but they are less technically efficient compared to the metafrontier (0.51). The group efficiencies of the smallholder farmers also showed a large variation ranging from 3% to 100%, while commercial farmers have high levels of efficiency compared to both the group frontier (0.89) and the metafrontier (0.88). Results from the Tobit regression indicate that farmers' managerial decisions are an important determinant of their technical efficiency. We conclude that smallholder farmers first need to increase their level of technical efficiency relative to their peers before aiming to compete with commercial farmers. •Smallholder farmers should first improve their resource use efficiency compared to their fellow smallholder farmers before they consider comparing themselves against the commercial farmers. The structure of the agricultural sector in South Africa is dualistic in nature, with the sector comprising the well-developed commercial sector and the resource-poor smallholder farmers.1 Sandrey and Vink2, as cited by Tshuma3, argue that the commercial sector in South Africa consists of a few very big, successful and profit-oriented farmers who mostly use advanced production technology. The smallholder-farming sector is, however, dominant in rural areas of South Africa where about 70% of the poorest households are found.3 According to the National Department of Agriculture4, commercial agriculture follows a more capital-intensive growth path while substantial agricultural resources lie unused or underutilised in rural areas. Others7,8 have argued that smallholder farmers' productivity could be improved by improving the technological application of resources. They further argued that yield could be improved by increasing technical efficiency of production, without involving additional production resources and without adopting new technology. Most studies estimate technical efficiency levels and identify the sources of inefficiency for smallholder farmers9-17 or commercial farmers18,19. Studies that compare smallholder and commercial farmers' technical efficiencies within vegetable production are limited. Murthy et al.20 estimated technical and scale efficiencies for tomato producers in Karnataka, considering different farm sizes (small, medium and large farms), with the use of a data envelopment analysis (DEA). The estimated efficiency levels were 77.7% for small farms, 82.5% for medium farms and 72.9% for large farms. The results showed that an optimal farm size would result in higher technical efficiency levels. They continued to pool the data to estimate the metafrontier (average efficiency score of 86.7%), but failed to compare the results for the various sized farms against the metafrontier. Some of the studies conducted within South Africa include those of Mkhabela21 and Khaile22. Mkhabela21 used a stochastic production function (SFA) approach to investigate vegetable production for small- and large-scale farmers. Mkhabela identified vegetable farmers who produce on an area smaller than 1 ha as small-scale farmers, while those who produce on more than 1 ha as large-scale farmers, and found that large-scale farmers were technically more efficient in vegetable production than were small-scale producers. Khaile22 used a DEA approach to estimate technical efficiencies of small- and large-scale raisin producers in Eksteenskuil. Khaile used separate optimisations to estimate technical efficiencies for small- and large-scale producers and also found large-scale producers to be more efficient than small-scale producers. The main drawback of the abovementioned studies is that they failed to account for differences in production technology when comparing the production systems. Chen and Song23 stated that differences in farming technologies could change the production frontier. Therefore, technical efficiencies from different production frontiers are not comparable. The metafrontier model24 makes it possible to calculate comparable technical efficiencies for agricultural farms that operate under different technologies. The main aim of this study was to compare tomato productivity of commercial and smallholder tomato farmers in the Nkomazi area, Mpumalanga, using a metafrontier analysis. Smallholder and commercial farmers in Nkomazi operate under different production environments, using different technologies to produce tomatoes. Information on commercial and smallholder farmers' production efficiency can help identify strategies to move smallholder farmers into commercial markets. For this study, smallholder farmers were defined by their limited resource endowment compared to other farmers in the agricultural sector. These farmers were classified as farmers who produced on a very small piece of land, relied mostly on family labour, and produced primarily for home consumption. Commercial farmers produced primarily for a market, had access to productivity-improving resources, and used hired labour. The data for the research were collected from smallholder and commercial tomato farmers in the Nkomazi local municipality located in the Mpumalanga Province of South Africa. Data were collected with the use of a structured questionnaire. Personal interviews were conducted with farmers during May/June 2015 for the 2014/2015 tomato production season. The study was approved by the Ethics Committee of the Faculty of Natural and Agricultural Sciences of the University of the Free State (UFS-HSD2018/0934). The Nkomazi region is known for its dual agriculture system which consists of commercial and smallholder farming. The area has also been described to be among the areas with the highest agricultural potential in South Africa.25 The local municipality is situated within the eastern part of the Ehlanzeni District municipality. The Nkomazi region experiences frost-free winters with an average minimum temperature of about 8 °C, which allows production of vegetables and subtropical fruit.26 The municipality falls within the summer rainfall region with the rainy season normally lasting from October to March. The estimated mean rainfall for the municipal area varies between approximately 500 mm and 1 600 mm per annum.27 Summers are very hot and humid with an average maximum temperature of about 33 °C.26 The extreme maximum temperature is 41.7 °C and the extreme minimum -2.0 °C. The climatic conditions of Nkomazi are suitable for tomato production as tomatoes are a warm season crop that is sensitive to frost. The study area was chosen because of its distinctiveness with regard to agricultural potential. Moreover, the Nkomazi area, known as Malelane, is the main area of tomato production in Mpumalanga. A total of 102 tomato farmers were purposively selected and interviewed using a structured questionnaire. The group of sampled farmers consisted of 65 smallholder and 38 commercial farmers. After outliers were removed from the data the sample size was reduced to a total of 87 farmers of which 52 were smallholder farmers and the remaining 35 were commercial farmers. Production data collected with the questionnaire were the amount of tomatoes produced (kg/ha), fertiliser use (kg/ha), water use (number of irrigations in a season), seedlings (number of seedlings/ha), labour used (man-days/ha), and the amount of land used for tomato production (ha). The questionnaire also covered socio-economic, institutional and management factors, which were hypothesised to influence technical efficiency of farmers. where TEk defines a technical efficiency score that varies between zero and one. Values of the efficiency score (Equation 2) less than one indicate that output could increase through efficiency gains, without changing the levels of the inputs. The DEA model is estimated k times (once for smallholder and once for commercial tomato farmers), because the smallholder and commercial farmers use heterogeneous technologies. Smallholder and commercial tomato farmers are distinct from one another, because they face different constraints, have different resource endowments, and different opportunities for growth. As a result, the estimated technical efficiencies of heterogeneous groups cannot be compared. The performance of the smallholder and commercial tomato farmers can only be compared when taking the metafrontier as a reference. The metafrontier will never be below the group frontiers; hence, it captures the unrestricted technology set by enveloping the group frontiers.36 This implies that even if farmers are technically efficient compared with their own peers in group k, they are not necessarily efficient when assessed against the metafrontier. James Tobin first introduced the Tobit regression model in 1958.37 The Tobit regression is a censored regression model. A censored model implies that the dependent variable is limited by a maximum or minimum value or both.38 A Tobit model is preferred for cases in which the dependent variable is restricted in some way.39 The estimated technical efficiency score is a censored variable with a lower limit of zero (0) and an upper limit of one (1), therefore the Tobit regression model is well suited to estimate the factors affecting farmers' sources of efficiency. The Tobit regression model has also been used in a number of studies25,40-44 to determine the factors affecting variation in technical efficiency of farmers. The group frontiers (smallholder and commercial) and the metafrontier were estimated with the use of the production information obtained with the structured questionnaire. The output variable used in the DEA was tomato output measured in tonne/ha. While the input variables consisted of farmers' fertiliser use (measured in kg/ha), number of seedlings planted on a hectare of land (#seedlings/ha), and area under tomato production (ha). Farmers were also asked to indicate the volume of water used for irrigation during the production season. However, because farmers did not know the actual volume of irrigation water applied (mm), they were asked to indicate the number of irrigation sessions during the production season (#irri/season). Farmers were also asked to indicate the number of labourers employed during the production season. Typically smallholder farmers rely on family labour to produce crops while commercial farmers use hired labour. In this study, both family labour and hired labour were considered for the estimation of the technical efficiencies of tomato farmers. Although the farmers who used family labour did not necessarily pay for labour, there was still an opportunity cost for the family labour (i.e. missed opportunity to increase off-farm income). Furthermore, these farmers still had non-family members who assisted with production activities. As few farmers' knew how many hours of labour were spent on tomato production, they were asked to indicate labour use in terms of man-days used to produce tomatoes (man-days/ha). The average, standard deviation, minimum and maximum amounts of tomatoes produced and inputs used by smallholder and commercial tomato farmers are presented in Table 1. The data showed that smallholder farmers used on average 197 kg/ha of fertiliser, 26 irrigation sessions in a season, 8975 seedlings/ha, 755 man-days/ha and 0.3 ha to produce 5 tonnes of tomatoes on a hectare. Commercial farmers used 412 kg/ha of fertiliser, 21 irrigation sessions, 20 170 seedlings/ha, 336 man-days/ha to produce 96 t/ha on 5 ha of land. Data indicated that commercial farmers used more fertiliser, seedlings and land to produce more tomatoes. More importantly, the commercial farmers used fewer irrigation sessions and less labour to produce more tomatoes compared to the smallholder farmers. The reader is reminded that irrigation is measured as the number of irrigation sessions during a production season and not volume of irrigation water applied. Investigation of the farmers' irrigation practices revealed that smallholder farmers used predominantly watering cans and buckets to water tomato plants and irrigated the plants when the crop or soil appeared dry, whereas the commercial farmers used irrigation technology (e.g. drip irrigation) and a fixed irrigation schedule. The commercial farmers indicated that they irrigated tomato plants every 3-4 days. It is therefore possible that the smallholder farmers applied water every day or every other day, resulting in a higher number of irrigation sessions compared to those of the commercial farmers. The questionnaire included questions on socio-economic, institutional and management factors that were hypothesised to affect the farmers' level of technical efficiency. These variables were regressed against the technical efficiency scores estimated with Equation 2. Because the smallholder and commercial farmers were dealt with separately in the estimation of the efficiencies, two regressions were estimated to explain the sources of inefficiencies. The hypothesised variables, the description of the explanatory variables, and the expected relationship to technical efficiency are given in Table 2. 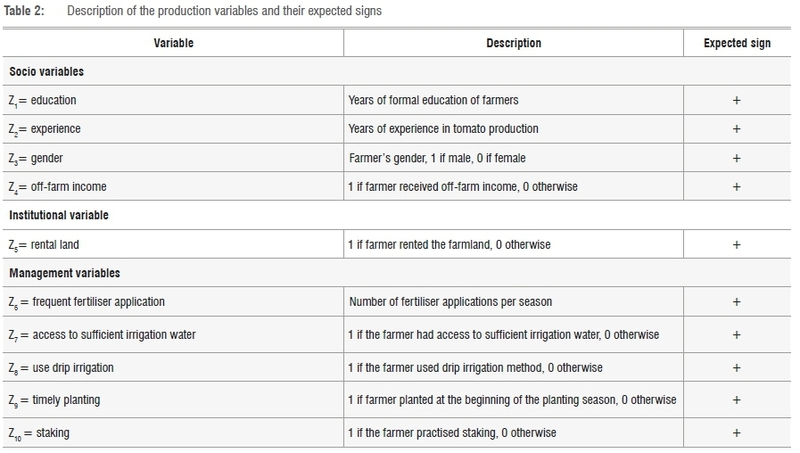 The socio-economic variables considered in this study included education, experience in tomato production, gender of farm manager (decision-maker), and access to off-farm income. Education and experience were included as continuous variables for which the farmer indicated their age and experience in tomato production in years. Gender of the farm manager was a binary variable, for which 1 indicated male and 0 indicated female. Farmers were asked to indicate if they had access to off-farm income, for which 1 indicated access and 0 no access. The sources of off-farm income were government grants and money sent home by family members who worked in nearby towns or cities. The farmers were also asked to indicate if they produced tomatoes on rented (coded as a 1) or owned land (0). The expectation was that farmers who used rented land would aim to increase farm profit through better management of resources, in other words that they would aim to maximise technical efficiency. To determine farmers' management practices, farmers were asked to indicate the number of times they applied fertiliser and if they had access to sufficient irrigation water (sufficient water indicated by a 1) to fulfil the crop water requirement. Farmers were also asked to indicate if they used advanced irrigation technologies (1 for drip irrigation) that would increase water use efficiency. Most smallholder farmers used either buckets or cans and flood irrigation to irrigate tomatoes. The farmers were therefore not certain whether they provided the crop with adequate water, which could have affected the amount of tomatoes produced. The presence of a more advanced irrigation technology was therefore expected to increase technical efficiency. Farmers were asked to indicate if they were able to plant tomatoes in a timely manner (1 indicated ability to plant in a timely manner and 0 not). Lastly, farmers were asked to indicate if they used staking to reduce the occurrence of tomato diseases and pests (1 indicated the use of staking, 0 otherwise). It was expected that the use of staking would increase tomato production and thereby increase technical efficiency. The CDF indicated the technical efficiency scores as a continuous distribution that could be investigated. The CDF indicated that technical efficiencies of smallholder tomato farmers ranged from 3% to 100%. The difference between the lowest and the highest efficiency scores indicated that resource use efficiency differed greatly among smallholder tomato farmers. The estimated average technical efficiency score of smallholder tomato farmers was 74%, with a standard deviation of 35%. The average efficiency score revealed that smallholder tomato farmers had the potential to increase tomato output by 26% (1-0.74) using their current farm resources and technologies. About half (52%) of the smallholder farmers operated on the efficiency frontier (TE=1) while the remaining 48% operated under the efficiency frontier (TE<1). Surprisingly, only 43% of the commercial farmers operated on the frontier while the majority (57%) were not operating on the efficiency frontier. However, the variation in the estimated efficiency scores for the commercial farmers was low, with an average of 89% and a standard deviation of 13%. In addition, a staggering 95% of the commercial farmers had a technical efficiency score above 60%, while only 70% of the smallholder farmers had technical efficiency scores above 60%. The average technical efficiency scores of smallholder (74%) and commercial farmers (89%) were higher than the respective 69% and 65% reported by Enwerem and Ohajianya47 for rice farmers in Nigeria. 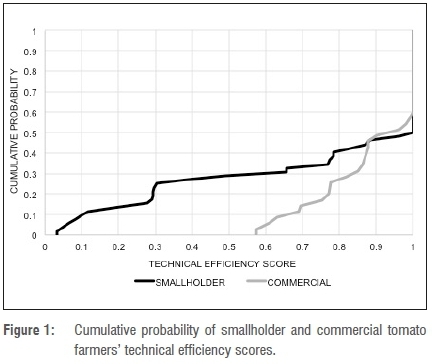 Mburu et al.48 in their analysis of economic efficiency of wheat farmers in Kenya found slightly higher technical efficiency scores for smallholder (85%) and large-scale (91%) farmers. Similarly, Khaile22 also found that commercial raisin farmers in Eksteenskuil, South Africa, were more technically efficient (85%) than the smallholder raisin farmers (81%). About half of the smallholder and commercial tomato farmers in this study were thus technically inefficient based on their estimated group frontiers, meaning that both groups could improve their resource use decisions. In order to improve performance, tomato farmers must know what to change or increase in order to increase efficiency. 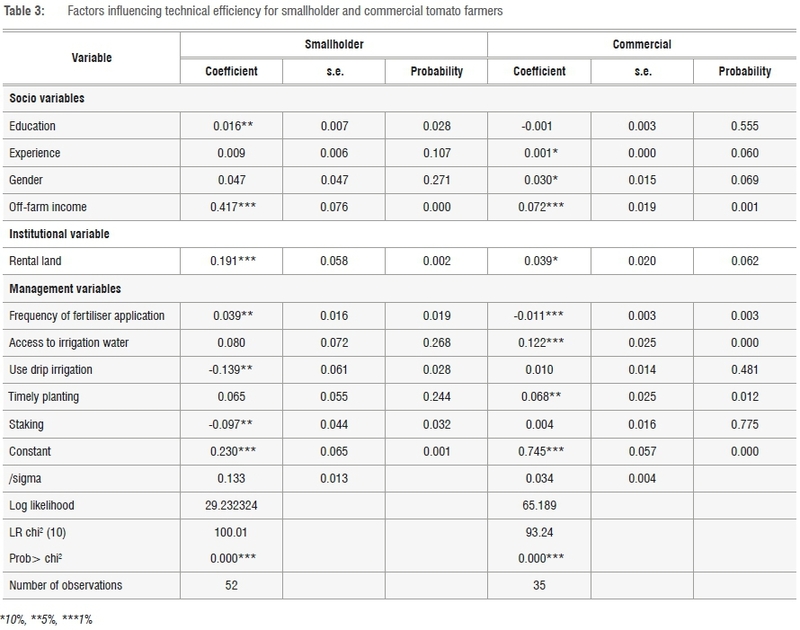 The results for the factors that influenced technical efficiency of smallholder and commercial farmers are presented in Table 3. Results for the smallholder farmers indicated that education, off-farm income, rental land, frequency of fertiliser application, use of drip irrigation and staking of tomatoes had a significant effect on technical efficiency. Increased levels of education resulted in a significant increase (p<0.05) in smallholder tomato production. Results were consistent with those of Itam et al.49 and Chepng'etich et al.30 who found that smallholder farmers' with a higher level of education were more technically efficient than uneducated farmers. Formal education increased farmers' ability to investigate and adopt new technology, which tended to move farmers closer to the frontier. Similar to the results for commercial farmers, smallholder farmers' efficiency was increased by the availability of off-farm income (p<0.01) and the use of rental land (p<0.01). Again, farmers who had access to off-farm income were better able to obtain improved production inputs and to obtain these inputs in a timely manner. The use of rental land to produce crops indicated that the farmers were not interested in producing for home consumption alone. These farmers would therefore have been interested in increasing the returns they received from renting production land, and therefore it was expected that the renting of agricultural land was associated with more efficient farmers. An increase in the frequency of fertiliser application significantly increased (p<0.05) the efficiency of smallholder tomato production. This result indicates that smallholder farmers who applied fertiliser more often during tomato production were more technically efficient. The use of drip irrigation (p<0.05) and staking (p<0.05) decreased the level of efficiency of tomato production. The results indicated that smallholder farmers who used drip irrigation in the Nkomazi area were technically inefficient. The unexpected negative result was probably because smallholder farmers in the study area lacked the knowledge to use the irrigation technology correctly. Thus the farmers were either under- or over-irrigating the tomatoes. The negative result for staking was not consistent with the results of Gojeh et al.50 who found that staking was beneficial in tomato cultivation. During the staking process, plants could have been handled incorrectly (and damaged), thus reducing fruit formation, or the weight of the hanging fruit resulted in injury or stress, thereby reducing the quality and size of the fruit. Alternatively, the use of stacking in combination with the use of inefficient irrigation systems (e.g. watering cans and buckets) could have resulted in water-stressed tomato plants. Staking lifts the plant from the ground, thus exposing the plant and soil to the sun and wind. As a result, plants would have required increased irrigation water as a result of increased evapotranspiration. Failure to supply the required water would result in water stress, decreased plant development, decreased fruit formation, and decreased levels of technical efficiency. As expected, off-farm income (0.072) for commercial farmers was positively related and statistically significant at a 1% level. It was expected that farmers who had a source of off-farm income were more technically efficient than commercial farmers with no off-farm income. Off-farm income increased the chance for farmers to easily and timeously buy important inputs such as fertiliser and pesticides. Results also indicated that the use of rental land to produce tomatoes (p<0.1) increased the farmers' technical efficiency. These results were similar to that of Chimai29 who found that using rented land had a positive influence on efficiency in field crop production because renting land is an added cost to the farmer. The farmer would therefore wish to be more efficient in their production, in order to justify the additional costs of renting land. It was expected that frequent application of fertiliser would increase farmers' technical efficiency. However, results indicate that frequent fertiliser application reduced commercial farmers' technical efficiency at a statistically significant 1% level. There are a number of possible explanations for the negative relationship to fertiliser application. One possible explanation could be that the farmers over-utilised fertiliser trying to improve output, while the over-utilisation of fertiliser probably resulted in a decrease in tomato output. Another possible explanation could be that the fertiliser was applied at the wrong times. However, it is difficult to tell exactly what the cause of the negative coefficient was, as we did not test for over-application of fertiliser or the timing of fertiliser application. Access to sufficient irrigation water (p<0.01) and the timely planting of seedlings (p<0.05) increased technical efficiency for commercial tomato production. Results indicated that access to enough water for irrigation in tomato production was important and hence increased technical efficiency. The planting of tomatoes early in the production season (timely planting of tomatoes) would have increased technical efficiency. Commercial farmers indicated that the challenge with late tomato planting in Nkomazi was the weather. During planting, rain could have resulted in blight fungal disease, because the leaves remained wet for extended periods. The results for the group frontiers indicated that the technical efficiency levels for the smallholder and commercial farmers were different. However, the group frontiers cannot be used to draw a conclusion regarding the similarity or differences in the farmers' resource use management decisions, as the farmers faced different environmental and production conditions. As a result, a metafrontier was estimated to present a common frontier that could be used for comparison of the farmers with the common benchmark. A comparison between the distribution of technical efficiency scores for the group frontiers and relative to the metafrontier is indicated in Figure 2 as a CDF. SMALLHOLDER and COMMERCIAL are used to denote the technical efficiency of the smallholder and commercial tomato farmers, respectively. An asterisk (*) is used to indicate the technical efficiency relative to the metafrontier. The CDF indicates that smallholder farmers' technical efficiency relative to the metafrontier (TE*) ranged from 1% to 100%. The wide range in estimated technical efficiency scores of smallholder farmers indicates the huge variation in resource use efficiency. It is interesting to note that about 38% (1-0.62) of the smallholder farmers were technically efficient (100%) relative to the metafrontier, while nearly 50% of the farmers were efficient relative to the group frontier. A large group of the farmers (58%) had an efficiency score (TE*) below 40%; as a result the smallholder farmers' average efficiency level relative to the metafrontier was 51% compared to the 74% for the group frontier. Results for the technical efficiency of smallholder farmers indicate that the level of inefficiency estimated relative to the metafrontier was higher than that estimated for the smallholder group frontier. The implication of this result is that the average smallholder farmers found it difficult to compete with the farmers who formed the common benchmark. The average TE* score estimated for the commercial farmers was 88% with a standard deviation of 13%. The variation in the estimated TE* for commercial farmers was much lower than that estimated for the smallholder farmers. Even though some farmers showed a slight decrease in their estimated TE* compared with the TE estimated from the group frontier, the average TE* decreased by 1% to 88%. The number of farmers who were producing on the frontier decreased from 43% for the group frontier to 37% for the metafrontier. Therefore, the results indicate that, compared to the common benchmark, the commercial farmers were performing much better than the smallholder farmers, with more commercial farmers operating closer to the common benchmark. This result is similar to that of Temoso et al.52 who found that commercial beef producers' average technical efficiency relative to the metafrontier (74%) was higher than that of traditional farms (smallholder farmers) (71%) in Botswana. Our aim was to investigate the technical efficiencies of smallholder and commercial tomato farmers in the Nkomazi area of South Africa. Identification of the differences in these farmers' technical efficiencies and the factors that influence their level of inefficiency can help identify strategies to move smallholder farmers into commercial markets. Results for the group technical efficiencies showed that smallholder and commercial tomato farmers were fairly efficient with an average efficiency of 74% and 89%, respectively. There was, however, still some room for improvement, which was highlighted by the large variability in smallholder technical efficiency. In conclusion, both groups of farmers were fairly efficient when compared to their peers. However, some of the commercial and smallholder farmers could still improve their technical efficiency by improving their input use decisions. The results from the Tobit model show that experience, gender, off-farm income, rental land, frequent fertiliser application, access to sufficient irrigation water and timely planting had a significant impact on technical efficiency of commercial tomato farmers in Nkomazi. Education, off-farm income, rental land, frequent fertiliser application, use of drip irrigation and staking of tomatoes were significant factors for technical efficiency in smallholder tomato production. Results for the factors influencing farmers' technical efficiency indicate that the factors which increased or decreased technical efficiency were different for smallholder and commercial farmers. Only two factors had a significantly positive effect for both groups of farmers: off-farm income and the renting of additional land. The remaining variables indicated that management decisions (frequency of fertiliser applications, use of irrigation and irrigation technology, timely planting and staking) impacted smallholder and commercial farmers' technical efficiency in tomato production. The conclusion is that assistance provided to tomato farmers should focus on production management. The results for the metafrontier again show that the commercial farmers were fairly efficient in tomato production, with an average efficiency of 88%. The smallholder tomato farmers were much less efficient compared to the metafrontier, with an average efficiency of 51%, although there were some smallholder farmers with scores on the metafrontier. The results therefore indicate that the smallholder tomato farmers would have to make fairly substantial changes to their production practices, which include their production technologies, in order to compete with the farmers who represented the metafrontier. However, it would not make sense for the smallholder farmers to improve their production relative to the metafrontier if they were still under-performing compared with their peers, as measured with the group frontier. Therefore, smallholder farmers must first increase their technical efficiency relative to other smallholder farmers, before aiming to improve relative to the metafrontier and, in so doing, commercial farmers. A possible means to provide assistance to farmers could be through extension services. However, the extension officers should be trained to provide guidance to farmers regarding appropriate management decisions which would improve farmers' technical efficiency. Farmers should be encouraged to utilise existing agricultural support programmes like Masibuyele emasimini ('going back to till the land') that aim to improve farmers' productivity. These support programmes should be tailored to provide production management guidance and not only provide inputs to beneficiaries. However, more empirical research is needed to fully understand the technical efficiency differences between smallholder and commercial farmers. A better understanding of such differences will allow for the development of better systems to assist both smallholder and commercial farmers, and could provide the necessary understanding on how to integrate smallholder farmers into commercial markets. This work was supported by the Agricultural Research Council (ARC) under the Professional Development Program (PDP). Financial and other assistance by the ARC are gratefully acknowledged. J.Z.G. : data collection, data analysis, writing the initial draft, funding acquisition. N.M.: student supervision, writing revisions, critically reviewing the writing.